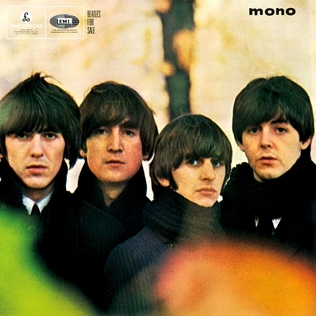 The Beatles’ fourth album leads off with probably the best album side of their career to this point. The first three songs are dark, dark, and dark. “No Reply” starts off spooky and just gets spookier. The narrator calls on a girl, both by phone and in person, only to be told she’s not home, but he knows that’s a lie because he saw the light, he saw her in the window, he “knows where she’s been,” and he “saw her walk in her door.” After that it gets explicitly threatening, “If I were you, I’d realize that I/Love you more than any other guy.” Hard to imagine a girl wouldn’t react positively to that. That’s followed by “I’m A Loser,” sung from the depths of dark loneliness post-breakup, and then we have “Baby’s In Black,” about a girl who won’t stop wearing black for her dead boyfriend. That first side is seven great tracks, one after the other, bam bam bam. And from there they start of side two with the only song from here you know, “Eight Days A Week,” which fits squarely into the band’s A Hard Day’s Night and Help! styles from this period. And then after that…blum blum blumble blum…the album falls down the stairs. The last six songs are a mix of bad, meh, and the occasional good song. If they’d kept the worst few songs off the album (though it is only 34 minutes as it is) I’d say that they were just unable to keep up the momentum. As it is, though, it’s flawed. The rest of the album pulls everything up a bit again, though they don’t quite reach the heights of the first eight tracks until the album closer, a cover of Perkins’ “Everybody’s Trying To Be My Baby.” “Every Little Thing” isn’t great, but the little guitar licks that fill in the spaces around the vocals along with the two-note tom (tympani? kettle drum?) hits make it enjoyable. “I Don’t Want To Spoil The Party” should have been named “I Still Love Her,” but it’s fine. “What You’re Doing,” the penultimate track, is another big dip in quality. It’s interesting how, when The Beatles wrote mediocre songs, they still did it in such a mediocre way. Like, “Every Little Thing” and “What You’re Doing” are so unmistakeably Beatles. If they hadn’t written them and somebody else had, music critics would immediately call them Beatles-esque. And I guess it’s just bizarre to hear something that so inherently of The Beatles and yet not super, super good. We’ve just become accustomed to associating those qualities with their awesomeness, but these songs are examples that their great songs were, in addition to being arranged really well, just great songs. Filed Between: A Hard Day’s Night and Help! This entry was posted in album reviews, CD reviews, music and tagged 1964, 4 clowns, album reviews, CD reviews, music, The Beatles by fatclown. Bookmark the permalink.